Western Digital’s Sentinel RX4100 is a fast rack-mount, network-attached storage device that runs Microsoft’s Windows Storage Server R2 Essentials, and it might change your mind about how your small business handles storage. Rack-mount equipment is pricier than desktop gear, and it requires an investment in a rack (if you don’t already have one). On the upside, rack-mount devices are easier to cable, organize, maintain, and expand. And equipped with antitheft mounting hardware, a rack provides much better physical security. Last but not least, it’ll impress your clients. A dual-lock security bezel prevents unauthorized access to the four drives inside the WD Sentinel RX4100. The Sentinel RX4100 is a four-bay, 1U (unit) rackmount, which means it takes up only one standard two-inch vertical rack space. It houses four quick-change drive caddies and a double-locking bezel to discourage theft (it locks down on both the left and the right). 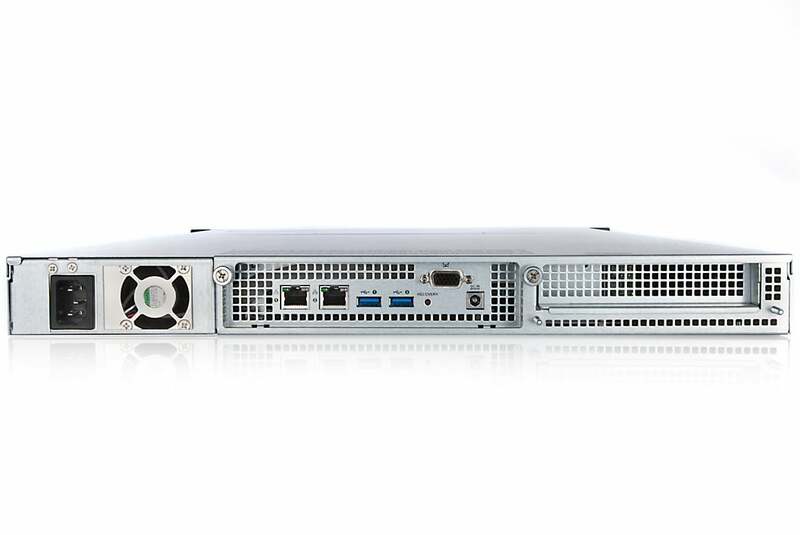 The RX4100 can be ordered with dual, redundant power supplies, but our test unit had only one. The RX4100 has an internal power supply, but you can also plug in an external power brick as a backup in case it should fail. That’s more than adequate horsepower for a small-business NAS, and WD has put a very reasonable price tag on this one: $1900 with 8TB of storage, $2000 with 12TB, and $2350 with 16TB. One area where WD missed the mark is in the meager number—and odd arrangement—of peripheral ports. The RX4100 has two USB 3.0 ports that could be used for speedy local backups; unfortunately, they’re on the back of the unit. There’s a USB 2.0 port in the front, securely hidden under the security bezel, but that’s a slow way to move a lot of data. WD should have provided two USB 2.0 ports in the rear, to support a mouse and keyboard. There’s also no eSATA port, so you can forget about backing up to—or expanding the available storage of—an eSATA rack-mount drive array. If you want to connect a local display to configure or monitor the RX4100, you’ll use the VGA port in the back. We found that our test RX4100 was using a standard Microsoft VGA driver, which maxes out at resolution of 1024 by 768 pixels. PCWorld Lab Manager Tony Leung managed to install the Windows 7 drivers for the integrated Intel Graphics Media Accelerator 3150 using Windows 7 compatibility mode, but that required using a device manager and disabling what the driver thought was a second monitor. Even then, resolution maxed out at 1600 by 900. This is a minor issue, but hardware-specific drivers should come preinstalled. Backing up and controlling the RX4100 remotely via RDP (Remote Desktop Protocol) is easy; however, any NAS or server product above the consumer level allows direct use so that you can troubleshoot or configure the device while the network is down. The configuration reviewed here includes four 2TB, enterprise-class Western Digital WD2009FYPX hard drives in a RAID 5 array (5TB usable of the 8TB capacity). Benchmark results identify it as the fastest NAS we’ve tested on two counts, and the second-fastest NAS we’ve tested overall. It wrote our 10GB mix of files and folders at 41.8 megabytes per second and read them at a speedy 53.7 MBps, the latter earning it a first-place showing. In the real world, that means documents and databases will open faster. The RX4100’s reading of our single large 10GB file proceeded at 96.5 MBps—a nice clip, but it wrote the same file at a blistering 96.4MBps—another record. The write speed bodes particularly well for rapidly backing up the PCs over your network. Speaking of backups, the RX4100 natively supports bare-metal backup for 25 PCs on the network, and Western Digital offers KeepVault online backup for storing those backups safely in a remote location. KeepVault costs $300 for 250GB, $600 for 500GB, and $1000 for 1TB on an annual basis (monthly rates are also available). As I mentioned earlier, the RX4100 runs Windows Storage Server 2008 Essentials. Being a subset of Microsoft’s full server operating system, Essentials has a somewhat Spartan feature set. But it does support Active Directory via joining a domain, it has a nice dashboard app for PCs that lets you view the current state of the box, and it requires no CD to set up, as older versions did. You surf to the RX4100’s IP address (add \setup) and get started. The Sentinel RX4100 is an affordable and fast entry-level rack-mount NAS. Aside from its port array, its faults are minor. It’s more than suitable for SMB file sharing, and it’s particularly good for backups. Western Digital provides plenty of value in this entry-level rack-mount NAS, but the device does have a couple of minor flaws.